Tired of getting in groups (Guilds, Raid, Mythics +) with undesirable people on it ? This is the solution! 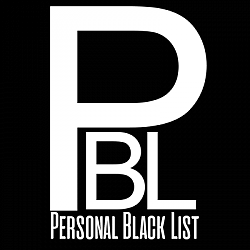 The Personal Blacklist or PBL gives you the possibility to store the names of those undesirable players and categorize them. How this helps you ? The PBL also gives you the possibility to see on your LFG and Player Tooltips a little warning that they are on your list and not just that also the PBL has an internal functionality that if you get in a group with a player, that's part of your list will show you a Warning mentioning that player and giving you the possibility to leave the group before your activity starts. When this Add-on is useful? Literally on any part of the game that includes matching with people that you don't know as Mythics +, Raids, Guilds , World & PvP. How to use it ? 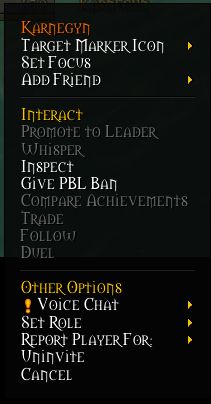 You can toggle the PBL UI by clicking your new minimap icon or by writing on your chat /pbl show, as soon you see your new interface,you just need to insert the name of the person in the current format: Name-Realm, pick a category and a reason for your ban and that's it that person now will be included on your Personal Blacklist. How to copy a weird name into the PBL ? Right Click the player portrait and select the option Give PBL Ban or simple toggle your chat and shift+click on the name of the person on the chat and you will get his name and realm on it , simply copy and paste that into your PBL. This Blacklist record will allow you to always remember the names of those undesirable players. - On Portrait Right Click - Now it shows the option Give PBL Ban to add the player selected to your PBL List. 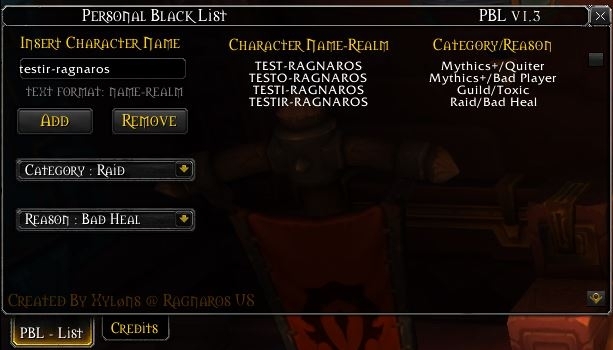 - New Class Column on the Ban List. - New Ban List Color to adjust to match the selected player class color. - Fixed a little Bug with the LFG Tooltip. - Added localization to confirmation "Want to leave this group" windows. - The confirmation windows now will show if there's one or more players on your list and the names. - Now the name of the latest player added to the list will show on top of the list. - Minimap Icon coords are now stored on the user session. - Changed Left Panel to be Static for a better user experience. -*Added some opacity to the author name on the PBL - List tab in order to have a cleaner UI. - Added Translations to the Credits Tab.